I’ve just spent a good hour with a needle and some wool, tending to my favourite shirt. It’s not something I habitually do, but the garment needs some care and I couldn’t manage without. We’ve done 15 years together. 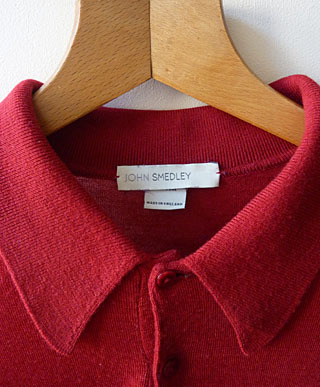 A John Smedley special in apple red. The unimpeachable Dorset style in fine, Merino wool, with the turnback rib cuff and the collar that always sits just so. Me and the shirt have done formal meetings and fierce parties. We’re travelled a bit and met interesting people. Even when the going has been messy, the shirt has sustained a fibre of grace, even when the wearer was lacking. It’s a shirt that gives everybody a bit of a chance. I bought my first John Smedley shirt about 1986 in Camden. I seem to remember getting it in an early Reiss shop, but such details are elusive. But I’m sure it was a navy short sleeve in sea island cotton, and I soon added a red version of the Isis design. We went to warehouse parties and north London dive bars. It was accompanied by a black MA1 jacket, selvage Levis, Doc Martin shoes and eventually Weejun loafers. When the NME offices moved from New Oxford Street to King’s Reach Tower in 1988, I found myself sitting next to Paolo Hewitt. He used a mechanical typewriter, smoked plenty and he wore John Smedley often. Paolo carried himself like Ray Liotta in Goodfellas. He recommended his tailor and he was an early adopter of house music. I was quietly awed because they guy had written those Style Council sleevenotes, using his alter ego, The Cappuccino Kid. Paolo and Paul Weller were longtime mates back them and the penchant for fine grade woolen shirts was a mutual, modernist deal. Occasionally the John Smedley has headed to the back of the wardrobe, but less so in recent years. It works for weddings and it delivers for rock and roll. Other proponents include Pete Doherty, Robbie Williams, Miles Kane and indeed, Roger Federer. I’ve tried cheaper brands, but they never hold up so well, and to collars just fail. Which is why I also have a Dorset in forest green, another reliable companion. Myself and the apple red shirt went to the launch of Belfast Music Week lately. 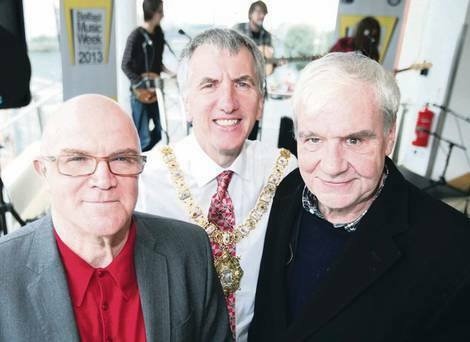 He’s a picture of us at the Waterfront Hall with the Lord Mayor and with Terri Hooley, punk godfather and subject of the tremendous Good Vibrations film. My speech was ok, but the Dorset was perfectly cool. Just as expected. I love that darned shirt.